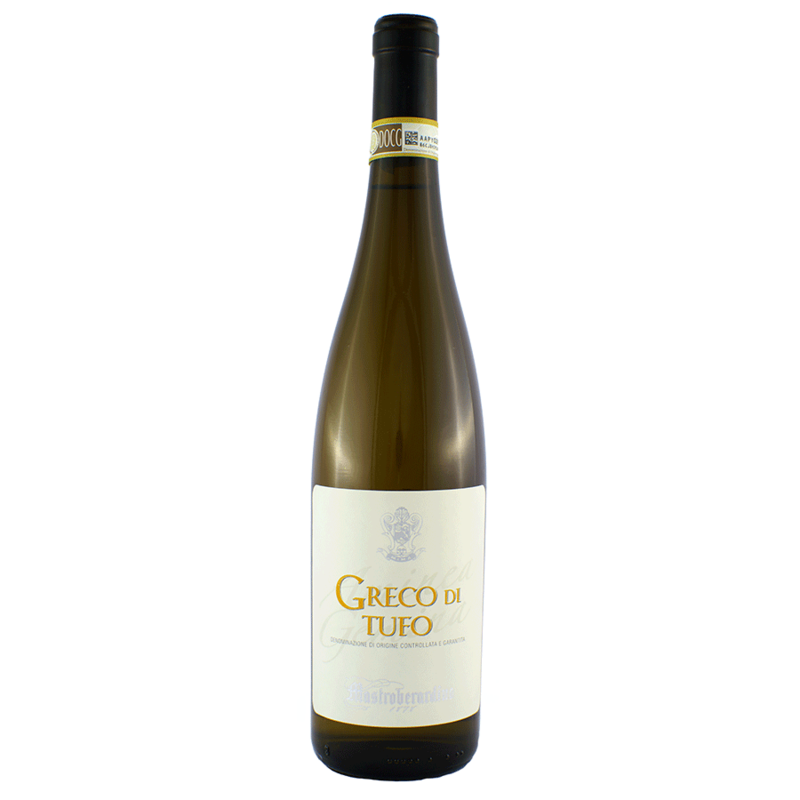 Greco di Tufo is one of the rare white wines to have a great ageing potential. This ancient and prestigious vine was brought in the province of Avellino by Pelasgians from Thessaly in Greece, in the first century BC. In the Campania region Greco is used to produce the Denominazione di Origine Controllata e Garantita (DOCG) wine Greco di Tufo. The name of the estate of Tufo clearly indicates the geological origin of the land on which the town stands. The small village was one of the most important mining centres in Southern Italy for the extraction of sulphur, which still makes itself evident in the aroma and flavour of the wines obtained in this terroir. The most distinctive feature of Greco di Tufo DOCG obtained from this site is expressed through notes of acidity along with sulphuric minerality. The vineyard of Petruro Irpino is situated on the border with the town of Tufo, characterised by the presence of soil rich in clay and stones. This grape of ancient nobility is found in the eight municipalities of Irpinia, an area enclosed in 61 square kilometres, on the hills by the Sabato river, its ideal location. The ancient planting of Greco in this area led to a perfect adaptation of the variety to the environment, in harmony with the climate, which is unusual here compared to other areas of Southern Italy.In the Campania region it is used to produce the Denominazione di Origine Controllata e Garantita (DOCG) wine Greco di Tufo. The estates of Tufo and Petruro Irpino are sited mainly on mid-mixture, loose and well drained soils on a South-East exposure and on avarage at 450 m a.s.l. The training system is the espalier with guyot pruning with a density of plantation of 3,000 vines/hectare (about 1,200 vines/acre) on average and an yeald of about 8,000 kg/ha (7,140 lbs/acres) and 2.6 kg/vine (5.8 lbs/vine). Classic white vinification in stainless steel tanks at controlled temperature. Refines for at least one month in the bottle. Hints of chamomile, pear, ripe fruits and dried fruits. Fresh, mineral, structured and persistent. Soups, shellfish, risottos, white meat, fried fish and vegetables.